^ Antonly Lester, "Brown v. Board of Education Overseas" PROCEEDINGS OF THE AMERICAN PHILOSOPHICAL SOCIETY VOL. 148, NO. 4, DECEMBER 2004 互联网档案馆的存檔，存档日期2015-05-01. ^ Mary L Dudziak "Brown as a Cold War Case" Journal of American History, June 2004 互联网档案馆的存檔，存档日期2014-12-07. ^ "Williams, Robert Franklin" King Encyclopedia, eds. Tenisha Armstrong, et al, Martin Luther King Jr. Research and Education Institute website. [2016-07-29]. （原始内容存档于2015-05-18）. ^ Chafe, William Henry. Civilities and civil rights : Greensboro, North Carolina, and the Black struggle for freedom. New York: Oxford University Press. 1980: 81. ISBN 0-19-502625-X. ^ Houston, Benjamin. The Nashville Way: Racial Etiquette and the Struggle for Social Justice in a Southern City. Athens, Georgia: University of Georgia Press. 2012. ISBN 0-8203-4326-9. ^ America's First Sit-Down Strike: The 1939 Alexandria Library Sit-In. City of Alexandria. [2010-02-11]. ^ Davis, Townsend. Weary Feet, Rested Souls: A Guided History of the Civil Rights Movement. New York: W. W. Norton & Company. 1998: 311. ISBN 0-393-04592-7. ^ Carson, Clayborne. In Struggle: SNCC and the Black Awakening of the 1960s. Cambridge: Harvard University Press. 1981: 311. ISBN 0-674-44727-1. ^ 47.0 47.1 47.2 Arsenault, Raymond. 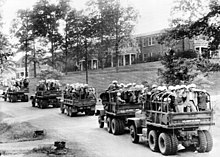 Freedom Riders: 1961 and the Struggle for Racial Justice. Oxford Press. 2006. ^ Hartford, Bruce Hartford. Arrests in Jackson MS. 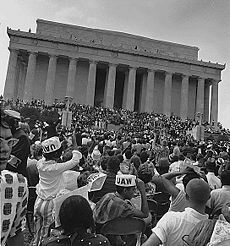 The Civil Rights Movement Veterans website. Westwind Writers Inc. [2011-10-21]. ^ 55.0 55.1 William H. Tucker, The Funding of Scientific Racism: Wickliffe Draper and the Pioneer Fund, University of Illinois Press (May 30, 2007), pp 165–66. ^ 57.0 57.1 A House Divided |. Southern Poverty Law Center. [2010-10-30]. （原始内容存档于28 October 2010）. ^ , University of Southern Mississippi Library 互联网档案馆的存檔，存档日期2009-09-17. ^ Letter from a Birmingham Jail ~ King Research & Education Institute at Stanford Univ. ^ Freedom-Now" Time, May 17, 1963 互联网档案馆的存檔，存档日期2015-03-09. ; Glenn T. Eskew, But for Birmingham: The Local and National Struggles in the Civil Rights Movement (University of North Carolina Press, 1997), 301. ^ Pennsylvania Historical and Museum Commission website, "The Civil Rights Movement"
^ Maryland State Archives "The Cambridge Riots of 1963 and 1967"
^ Tony Ortega "Miss Lorraine Hansberry & Bobby Kennedy" Village Voice, May 4, 2009 互联网档案馆的存檔，存档日期2012-10-18. ^ Schlesinger, Robert Kennedy and His Times (1978), p. 332-333. ^ "Radio and Television Report to the American People on Civil Rights," June 11, 1963, transcript from the JFK library. ^ Medgar Evers, a worthwhile article, on The Mississippi Writers Page, a website of the University of Mississippi English Department. 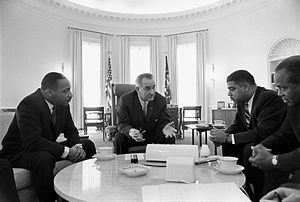 ^ 82.0 82.1 Civil Rights bill submitted, and date of JFK murder, plus graphic events of the March on Washington. 互联网档案馆的存檔，存档日期2007-10-12. This is an Abbeville Press website, a large informative article apparently from the book The Civil Rights Movement (ISBN 978-0-7892-0123-2). ^ 85.0 85.1 Television News and the Civil Rights Struggle: The Views in Virginia and Mississippi. Southern Spaces. 2004-11-03 [2012-11-08]. 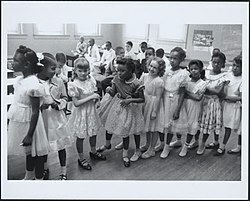 ^ Cambridge, Maryland, activists campaign for desegregation, USA, 1962-1963. Global Nonviolent Action Database. Swarthmore College. [2015-01-13]. ^ Harlem CORE, "Film clip of Harlem CORE chairman Gladys Harrington speaking on Malcolm X". ^ American Public Radio, "Malcolm X: The Ballot or the Bullet-Background"
^ Lewis, John. Walking With the Wind. Simon & Schuster. 1998. ^ Fannie Lou Hamer, Speech Delivered with Malcolm X at the Williams Institutional CME Church, Harlem, New York, December 20, 1964. ^ McAdam, Doug. Freedom Summer. Oxford University Press. 1988. ISBN 0-19-504367-7. ^ Carson, Clayborne. In Struggle: SNCC and the Black Awakening of the 1960s. Harvard University Press. 1981. ^ Reeves 1993, pp. 521–524. ^ MLK's Nobel Peace Prize acceptance speech on December 10, 1964. ^ Coretta Scott King. Spartacus Educational Publishers. [2010-10-30]. （原始内容存档于2010-07-05）. ^ Winner, Lauren F. "Doubtless Sincere: New Characters in the Civil Rights Cast." In The Role of Ideas in the Civil Rights South, edited by Ted Ownby. Jackson: University Press of Mississippi, 2002, p. 158-159. ^ Winner, Doubtless Sincere, 164–165. ^ Winner, Doubtless Sincere, 166–167. ^ Michael E. Eidenmuller. John F. Kennedy – Civil Rights Address. American Rhetoric. 1963-06-11 [2010-10-30]. ^ Ripple of Hope in the Land of Apartheid: Robert Kennedy in South Africa, June 1966 互联网档案馆的存檔，存档日期2005-03-13. ^ "No Place Like Home" Time Magazine. ^ How a Campaign for Racial Trust Turned Sour. Aliciapatterson.org. 1964-07-17 [2010-10-30]. （原始内容存档于2011-05-15）. ^ Coleman Young, Hard Stuff: The Autobiography of Mayor Coleman Young (1994) p.179. ^ Meinke, Samantha. Milliken v Bradley: The Northern Battle for Desegregation (PDF). Michigan Bar Journal. September 2011, 90 (9): 20–22 [2012-07-27]. ^ James, David R. (December 1989). "City Limits on Racial Equality: The Effects of City-Suburb Boundaries on Public-School Desegregation, 1968–1976". American Sociological Review 54 (6). Retrieved 29 July 2012. ^ Mike Alberti, "Squandered opportunities leave Detroit isolated" RemappingDebate.org. [2016-07-29]. （原始内容存档于2016-07-25）. ^ Gibson, Campbell; Kay Jung (February 2005). "Table 23. Michigan – Race and Hispanic Origin for Selected Large Cities and Other Places: Earliest Census to 1990". United States Census Bureau. ^ Year End Charts – Year-end Singles – Hot R&B/Hip-Hop Songs. Billboard.com. [2009-09-08]. （原始内容存档于2007-12-11）. ^ Riding On. Time (Time Inc.). 2007-07-07 [2007-10-23]. ^ ACLU Parchman Prison. [2007-11-29]. （原始内容存档于2008-03-07）. ^ Parchman Farm and the Ordeal of Jim Crow Justice. [2006-08-28]. （原始内容存档于2006-08-26）. ^ Goldman, Robert M. Goldman. "Worse Than Slavery": Parchman Farm and the Ordeal of Jim Crow Justice – book review. Hnet-online. April 1997 [2006-08-29]. （原始内容存档于2006-08-29）. ^ Cleaver, Eldridge. Soul on Ice. New York, NY: McGraw-Hill. 1967. Carson, Clayborne. In Struggle: SNCC and the Black Awakening of the 1960s. Cambridge, MA: Harvard University Press. 1980. ISBN 978-0-374-52356-5. Carson, Clayborne; Garrow, David J.; Kovach, Bill; Polsgrove, Carol, eds. Reporting Civil Rights: American Journalism 1941–1963 and Reporting Civil Rights: American Journalism 1963–1973. New York: Library of America, 2003. ISBN 978-1-931082-28-0 and ISBN 978-1-931082-29-7. Chandra, Siddharth and Angela Williams-Foster. "The 'Revolution of Rising Expectations,' Relative Deprivation, and the Urban Social Disorders of the 1960s: Evidence from State-Level Data." Social Science History, 29(2):299–332, 2005. Garrow, David J. 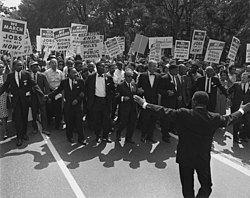 Bearing the Cross: Martin Luther King and the Southern Christian Leadership Conference. 800 pages. New York: William Morrow, 1986. ISBN 978-0-688-04794-8. Garrow, David J. The FBI and Martin Luther King. New York: W.W. Norton. 1981. Viking Press Reprint edition. 1983. ISBN 978-0-14-006486-5. Yale University Press; Revised and Expanded edition. 2006. ISBN 978-0-300-08731-4. Malcolm X (with the assistance of Alex Haley). The Autobiography of Malcolm X. New York: Random House, 1965. Paperback ISBN 978-0-345-35068-8. Hardcover ISBN 978-0-345-37975-7. Marable, Manning. Race, Reform and Rebellion: The Second Reconstruction in Black America, 1945–1982. 249 pages. University Press of Mississippi, 1984. ISBN 978-0-87805-225-7. Minchin, Timothy J. Hiring the Black Worker: The Racial Integration of the Southern Textile Industry, 1960–1980. University of North Carolina Press, 1999. ISBN 978-0-8078-2470-2. Reeves, Richard. President Kennedy: Profile of Power. New York: Simon & Schuster. 1993. ISBN 978-0-671-64879-4. 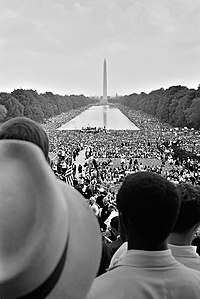 Civil Rights Movement Veterans ~ Movement history, personal stories, documents, and photos.